As seen by the two links, the similarities are obvious. Other than having classes with each other, Nuhring and Lane have no personal history with the writer. Trust in the media is at an all-time low. It seems that this article has already put a dent into the reputation of The Concordian. Since the article was published, 18 one-star reviews flooded the Facebook page, which prompted support from liberals and communists within the university. 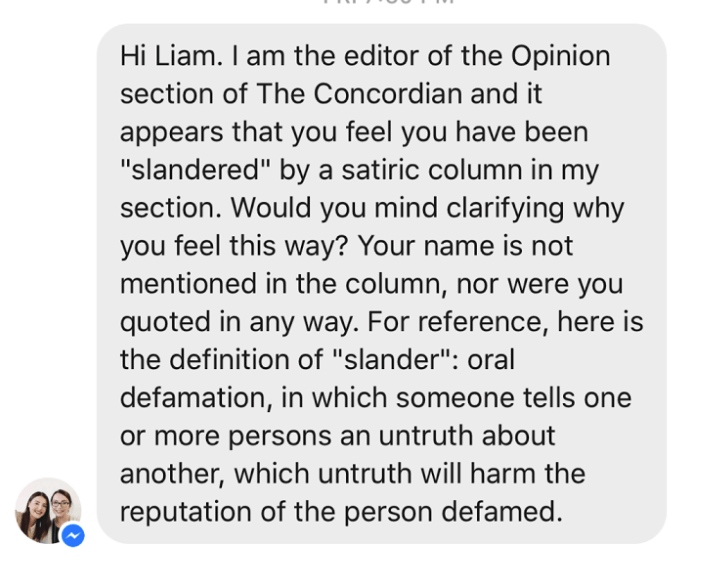 Catherine McMullen, a professor at Concordia and advisor to the paper, claimed that by criticizing the publication, we were violating their freedom of speech. I don’t think she realizes that freedom of speech is also granted to people with whom she disagrees. McMullen also gave me her number after making incendiary comments regarding me in a comment thread. If you look at my description on the Meet the Team page, I am involved in multiple libertarian organizations, so of course it is fairly obvious why I care about this issue. 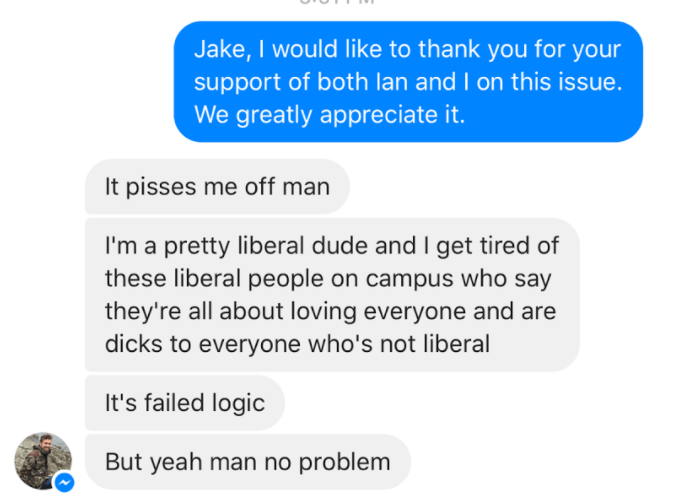 In a vocal interview, Liam called to my attention of a “libertarian and conservative witch hunt that is furnishing intolerance directed towards those that follow right-wing ideologies.” Being a libertarian college student and having seen the reaction of Concordia students and staff alike, I can certainly see this witch hunt in action. Perhaps the Minnesota HQ for the war against freedom is indeed at Concordia University. When I asked Ian and Liam about the results they desire from this incident, these were their answers. So no, Professor McMullen, we do not want to impede upon your personal favorites’ freedom of speech. But we most certainly want you to recognize our freedom of speech. We want open dialogue. We want to express our opinion. Perhaps a right-wing media source on campus is the answer. Ian and Liam have both advocated for freedom of speech. Liam has said that “Everyone has the explicit right to voice their feelings and opinions.” Ian has said that free speech “is valuable to the functioning of our society and it should not be infringed. Speech that mocks any individual is protected, but is also subject to scrutiny.” These guys are completely pro-free speech. As am I. Any accusation otherwise is a red herring. We simply want to put the spotlight on the explicit bias and ostracism that conservatives and libertarians face on college campus. For Nuhring, this incident is just the beginning. He has received multiple personal attacks for fighting for gun rights and for calling out the poor nature of this piece of journalism. Liam, however, has also received support from liberals that support honest journalism and free speech. Ian had no response when I asked if he had been attacked for this as well. Make of that what you will. In essence, you have the right to mock, but don’t be surprised when mockery hurts your reputation and legitimacy as a journalist. “It starts with recognizing the issues at hand across college campuses throughout this country, from the east to the west coast, and everywhere in between. Recognizing and bringing to light these unjust issues will hopefully create awareness and recognition of future conflicts, so that the publications can be more often held accountable.” Liam said this in regards to stopping instances like this from happening again. For a bit of humor, I asked Liam and Ian for their views on cannon control. If the media will be biased for the authoritarians, I will be biased for libertarians. Ian and Liam were unfairly targeted. This is one of thousands of stories of liberal bias on college campuses and outright bigotry from the Left. Action must be taken against this. If the Left won’t be unbiased (I personally think being unbiased is impossible) then the Right must show their cards. It is okay to be biased, if you are open about it. But The Concordian and other publications conceal their biases, and I say enough! It is time to wage war against they that conceal their bias. It is time for libertarian journalism to thrive. It is time to show that it is better to show your bias. Express your opinions openly, otherwise you will just be attempting to hide your opinions. Ian. Liam. Start a right wing newspaper at Concordia. Everyone, support those that are objective and/or openly express their bias and uphold respect in journalism. And destroy those that do not. The Concordian thinks you are stupid and cannot see the underlying anti-liberty message they send. Show them that they are wrong.